Norman Powell blossomed into UCLA’s go-to option in his final season as a Bruin, and was rewarded with a spot on the All-Pac-12 first team. The 6-foot-4 guard led his team in scoring, steals and free throw attempts, and ranked third in rebounds and assists. Powell was also a conference all-defensive honorable mention for the second year in a row. UCLA had landed multiple players on the All-Pac-12 first team in three of the last four seasons. Freshman Kevon Looney, who averaged 12.3 points and 9.5 rebounds, didn’t make the 10-member first team but earned a second-team nod. 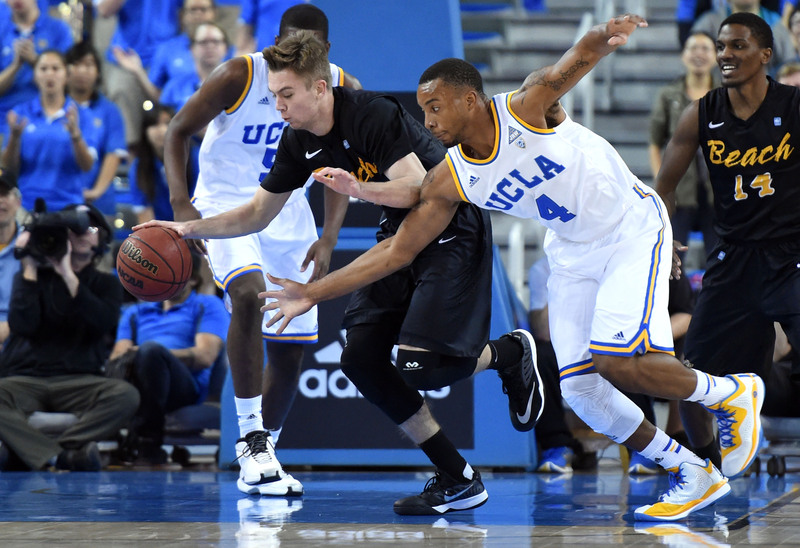 Sophomore point guard Bryce Alford was an All-Pac-12 honorable mention, rounding out a relatively unsurprising showing for the Bruins in the postseason awards. The big shocker came in Joseph Young winning Pac-12 Player of the Year, becoming the first Oregon player to do so since Luke Ridnour in 2003. Young led the conference with 19.8 points per game, but isn’t as well-rounded a player as Arizona’s T.J. McConnell or Utah’s Delon Wright — two players who were the presumptive frontrunners for the league’s top individual honor. It certainly helped Young’s case that Oregon won nine of its last 10 games to clinch the No. 2 seed in the Pac-12 Tournament. Head coach Dana Altman was named Pac-12 Coach of the Year for the second time in three seasons. Scouting report: Oregon is a run-and-gun offense, one that can bury a team quickly if its shooters heat up. That’s what happened to UCLA when it traveled to Eugene last month. The Bruins played a level of defense that veered from lackadaisical to putrid — allowing the Ducks to shoot 75 percent from the field in the first half of an 82-64 blowout. UCLA senior Norman Powell called out the team for its defensive effort in Eugene, and it might be up to him again to make sure there isn’t a letdown after stifling Oregon State on Wednesday. Pac-12 links: Should USC hire Ed Orgeron? — After an upset of Stanford, many USC players called for the school to retain Ed Orgeron as head coach. NBC Sports’ Chris Huston, also known as the Heisman Pundit, argues against removing the “interim” tag. — Utah quarterback Travis Wilson’s career might be over after a post-concussion exam revealed a pre-existing neurological condition. — Washington State has extended Mike Leach through the 2018 season.